"The Ride of the Dullahan" appears in the 2014 Spring Equinox issue of Eternal Haunted Summer. A link to the poem may be found here: http://eternalhauntedsummer.com/issues/spring-equinox-2014/the-ride-of-the-dullahan/. "Ride" is one of my rhythmic narrative poems based on Celtic lore. The Dullahan is also known as "Death's Herald." If he calls out your name, you're done. 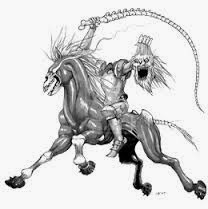 More about the legend of the Dullahan may be found here: http://www.irelandseye.com/paddy3/monstatxti.htm.